KIROW ARDELT GmbH operates globally as a crane builder and is the bulk handling specialist within the Kranunion group. With experience extending over more than 110 years, Kirow Ardelt offers a wide variety of bulk handling machines, ranging from the TUKAN double jib level luffing crane either with or without integrated hopper, to the KRANICH single jib crane or the PELIKAN balanced material handler;Ardelt is able to offer high quality customized solutions. Ardelt has been producing the PELIKAN, a hydraulic-driven material handler with a balanced jib-system, since 1992 selling multiple units in a variety of different sizes and executions. For operations where it is beneficial to force the grab into the bulk material, for example during handling of scrap metals or wood-chip, the PELIKAN, Ardelt’s equilibrium material handler, comes into its own. The PELIKAN is an expert in its field and has the ability to operate with pinpoint positioning and control, essential when handling large goods such as logs or steel slab. 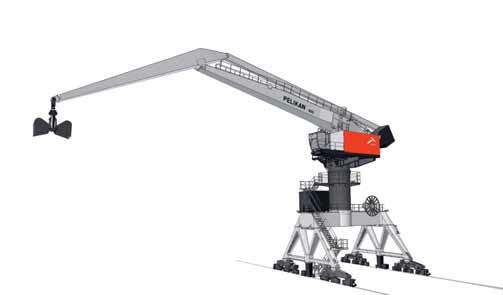 To achieve short delivery times, maintain a high level of quality and to be able to comply with different customer applications, the PELIKAN is constructed in standardized modules which can, in turn, be combined with a wide range of standard slewing parts, ranging from class sizes of 80 metric tonnes up to 800 metric tonnes and more. The standard slewable parts of the PELIKAN can be fitted with a variety of jib systems to adapt the material handler to the desired working area and required lifting heights. Equipped with a range of load-carrying attachments; hydraulic grabs, load hooks and magnets the PELIKAN is ideally suited to handle all types of bulk cargo. The PELIKAN is even capable of handling special goods if fitted with a vacuum lifting device. The wide choice of standard designed, but nevertheless custom build, lower structures enables optimum adaption to customer requirements and supports the logistics of the yard perfectly; for example the PELIKAN can be mounted on a high- gantry portal, which can be passed unhindered by vehicles below operating in the yard, or alternatively mounted onto a stationary pedestal. For travelling needs the PELIKAN can be rail-mounted or run on a crawler chassis. To further optimize the original design, and as a reaction to ever-increasing handling capacities and customer demands, the standard machine range has been extended recently with the launch of the redesigned PELIKAN 500, 600 and 800. Furthermore the development of even larger capacity machines is in the pipeline. The final construction phase of the first two machines ordered from the redesigned product range, in 600-tonne class size, with a lifting capacity of 15t at a maximum outreach of 38m is just reaching its conclusion. German engineering skills in combination with the long established experience of crane building and the cutting edge technology of established sub-suppliers guarantees the outstanding efficiency of the PELIKAN.